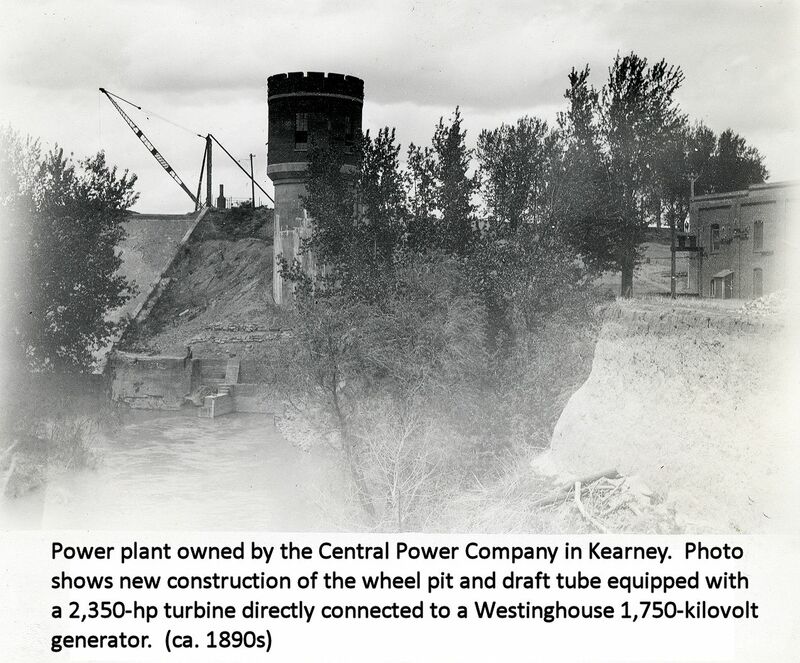 This year The Central Nebraska Public Power and Irrigation District is marking the 75th anniversary of the completion of Kingsley Dam in 1941. The stories about George P. Kingsley and C.W. McConaughy, two of the most prominent men in the creation of the hydro-irrigation project, have been well documented. However, the story of another pioneer who sought to bring hydropower and irrigation to south-central Nebraska, has been largely forgotten. Joel Hull was educated in Ohio as a lawyer, served as an officer in General Crook’s brigade during the Civil War and then entered the tannery business after the war. However, he soon became intrigued by the promises of cheap land, plentiful resources and the opportunity to make a fortune in the new land being settled “out west.” Some may have called him a speculator or a “Boomer,” but it could certainly be said that he was ambitious. He sold his tannery and moved to Nebraska in 1872. He settled first in Lowell in Kearney County, which then consisted of about six buildings and a handful of surrounding farms. He staked out a claim and started farming the virgin prairie, but he was never content as a farmer. He had bigger dreams. One of his first efforts – along with others who shared his way of thinking — was to move the county seat from Lowell, through which the railroad ran, to a little town in the center of the county that consisted of little more of than a post office operated by an old German immigrant. The immigrant had named the place Minden after his old home town in Germany. The people of the county approved the move of the county seat in 1876, although a court injunction delayed the official designation of Minden as the county seat until 1878. By then, a courthouse had been built, lots laid out, and a school and hotel were under construction. By 1880 there were 200 people living in Minden and 300 by 1882. The boom came in 1883 when the Burlington and Missouri Railroad laid tracks through the town and by the end of 1883, 1,200 people called Minden home. Hull contracted with surveyors to plot the course of his power canal. They produced plans for a 54-mile-long canal from near the mouth of Plum Creek on the Platte River north of Bertrand to Sand Creek near Minden. The plans for the canal would have followed a very similar route chosen in the late 1930s for Central’s Phelps Canal. All he needed was $150,000 to build the canal. But that’s as far as he got. No record of funds being raised or dirt being turned exists. Drought in the early 1890s was already forcing people out of the area as crops and businesses failed. When the Santa Fe Railroad abandoned plans to build a railroad through Minden to the Black Hills, his dream suffered another serious blow. But Hull wasn’t ready to give up. He revived his plans on a smaller scale in 1894. His canal would still produce hydropower, but would have more of a focus on irrigation. But the years 1895 to 1898 were wet years that made people forget the need for irrigation. Even two more years of drought in 1899 and 1900 could not convince people of the need for irrigation. However, between 1906 and 1915, average annual precipitation in the Kearney County area declined yearly. Hull died in 1914, and by then others had become convinced that the area could not prosper without a reliable supply of water to offset nature’s whims. In 1913, C.W. McConaughy, mayor of Holdrege and a grain merchant was driving through the fields north of Holdrege on what was known as the Elm Creek road. He spotted a wheat field that had an odd look to it. In some areas the wheat grew tall with full heads of grain; in others, the wheat was stunted and with sparse heads. Upon locating the owner of the field1, McConaughy learned that the field had been previously planted to corn. During harvest, the corn had been put up in shocks to dry. Subsequently, snow had collected around the shocks. When the snow melted, the water soaked into the ground. It was in these areas that the wheat grew best. An idea was born, an idea that would eventually lead to the construction of The Central Nebraska Public Power and Irrigation District’s hydro-irrigation project. The farmer was most likely O.T. Anderson, a supporter of the “Tri-County Project,” as it was then known, and later a member of CNPPID’s board of directors. He was identified in a March 21, 1938 article in the Holdrege Daily Citizen. In an interview with Moritz Aabel, who became a long-serving member of Central’s board, Mr. Aabel recalled mention by McConaughy of returning from a trip to Elm Creek during which he noticed the field. Such a route would have taken him past Anderson’s farm.